DE4-530 provides a FPGA-based prototyping platform for system designs that require high speed connectivity, large design capacity, great memory bandwidth, and programmability with high-performance and low-power consumption. 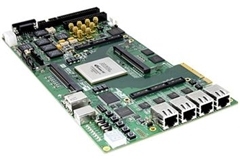 Based around the Terasic DE4-530 FPGA Development Board, it is equipped with industry-standard peripherals, connectors, and interfaces that offer a rich set of features suitable for a wide range of compute-intensive applications. All CMC Microsystem account holders from a member university with a Prototyping or Designer Subscription are authorized to access this technology. For more information, contact our Licensing Administrator at 613-530-4787 or licensing@cmc.ca.